Is there pain after getting a root canal? Are there special considerations for getting a root canal during pregnancy? What kind of problems or complications may occur after a root canal? When should a tooth be extracted instead of getting a root canal? Root canal treatment (RCT) and endodontic treatment are the more correct terms for a procedure that treats the nerve of the tooth. Endodontics is a specialty of dentistry that deals specifically with the tooth pulp and tissues surrounding the root of the tooth. A root canal problem may be treated by a general dentist or by an endodontist. An endodontist is a dentist who has gone to multiple years of specialty training after dental school to focus exclusively on root canal treatments. General dentists are qualified to perform root canals but may refer a patient to an endodontist if the tooth is particularly complicated or is being treated for the second time. When the root canal is treated, the dental pulp is removed and all the canals and pulp chamber of the tooth are filled and sealed to prevent bacteria from entering. There are many things that can damage the pulp or nerve of the tooth. Often a patient will feel pain or other symptoms that alert them to needing root canal treatment, but many times there are no symptoms or warnings. The following are some of the more common reasons for needing root canal treatment. Pain: A toothache is the most common symptom of needing a root canal. The pain that comes from a tooth needing a root canal is fairly specific. 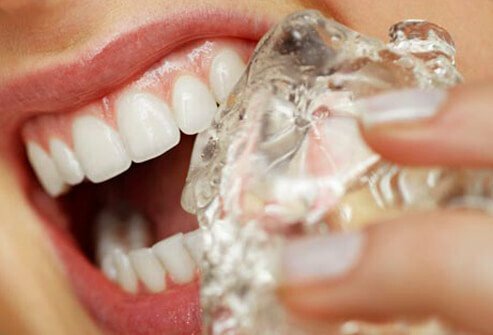 If the tooth is still alive, the affected person will experience extreme sensitivity to hot or cold liquids or foods and that sensitivity will continue even after the hot or cold stimulus is taken away from the tooth. Heat sensitivity, instead of cold, is a symptom that is very specific to a tooth requiring root canal treatment. The tooth may start to hurt spontaneously, in the middle of the night, or sometimes when the patient isn't even using the affected tooth to eat or drink. The pain can progress to a very severe generalized headache that may cause the person to even forget what initially caused the pain. If the tooth is dead and has become abscessed, the patient will feel pain when he or she chews food or puts pressure on the tooth. An abscess may or may not produce swelling or bleeding around the tooth, and sometimes it causes significant swelling of the cheek, jaw, or throat. If this swelling is noticed, treatment needs are urgent -- even if that means going to urgent care or the emergency room of a hospital. Many other conditions of the mouth can masquerade as a toothache. Therefore, it is very important, when feeling some pain around a tooth, to get a thorough examination with pulp vitality testing by a licensed dentist for a proper diagnosis. Sometimes a patient may feel intense tooth pain that makes them think they need root canal treatment, but the pain is a symptom of another problem requiring a different treatment. Root surfaces that have become exposed as a result of gum recession can mimic cold sensitivity. Sinus congestion can produce pressure around the roots of the upper teeth and cause pain upon chewing, which mimics root canal pain. Jaw pain can either be an indication of pain in the jaw joint or pain referred from a tooth needing a root canal. Even gum disease can mimic the throbbing pain around teeth that can feel similar to root canal pain. Abscess (infection): If a tooth has become abscessed, it will require a root canal. An abscess is an infection that forms when the pulp of the tooth dies and a pus pocket forms around the end of the root. The pus accumulates in an area of dead nerve tissue that is infected with bacteria. Sometimes the abscess will form a bump that looks like a pimple on the outside of the gums. A patient may even notice pus draining from the pimple or notice a bad taste in his or her mouth. An abscess that is left untreated will continue to grow and infect the bone around the root of the tooth. It may spread into surrounding bone and tissues. In rare cases, people have died from infections that started from a tooth abscess. Although antibiotics can help keep the infection from spreading, the only way to remove the infection completely is by performing root canal treatment and cleaning out all the dead tissue and bacteria inside the pulp chamber and root canals. There are other abscesses that can affect the teeth aside from endodontic abscesses. Periodontal abscesses can be painful, for example, and require different treatment than root canals. Deep cavity: If tooth decay extends deep into the tooth and reaches the pulp, the pulp will become infected with bacteria. When this happens, it will either become inflamed and painful or it will die and become decayed tissue. Sometimes there will be no pain, but the only way the dentist can get all of the tooth decay out of the tooth is by performing a root canal and removing the nerve that has become affected as well. Trauma: If a tooth is hit with great force, the nerve can be severed at the end of the root and eventually die. This could happen immediately after the traumatic incident, or it may happen over many years following the trauma. Fracture: A tooth that has become fractured may need a root canal if the fracture extends deep into the tooth and reaches the pulp. If a tooth has fractured in a way that doesn't leave very much tooth structure left above the gum line for a crown or other restoration, a root canal may need to be performed so a post can be placed down the canal of the tooth to help retain the restoration. Resorption: Root resorption is a condition whereby the tooth structure dissolves away as a reaction to injury, trauma, tooth replantation, or aggressive tooth movement during orthodontics. Not all of the causes of resorption are fully understood. 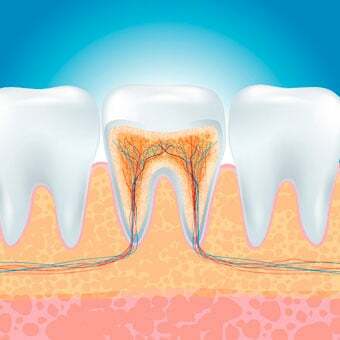 If the defect starts from the outside of the root and goes inward, it is called external root resorption. If the tooth dissolves from the middle or inside of the tooth and progresses toward the outside, it is classified as internal resorption. In either situation, the resorption can invade the pulp canal and the vital nerve and blood vessels contained therein. If this occurs, the tooth needs root canal treatment in combination with specialized conditioning and repairing of the defect quickly before the resorption destroys more tooth structure. The defect is typically repaired with a material called mineral trioxide aggregate (MTA). Resorption usually causes no pain and is usually only diagnosed using X-rays. Repeated dental procedures: Dental procedures produce significant stress on a tooth. Sometimes repeated drilling may cause the pulp of a tooth to become inflamed. The tooth will need to be tested by a dentist to determine whether the inflammation is reversible or irreversible. In the past, whenever one of these situations happened to a tooth, the only treatment option was to have it extracted. Root canal therapy is an extremely beneficial option that allows for most teeth to be saved in the mouth and used effectively for a very long time. Once the teeth are formed, they don't need the pulp to function properly. The pulp provides the tooth sensation to a stimulus like hot or cold, but it isn't required for the tooth to remain functional in a healthy mouth. To confirm that a tooth does indeed require root canal treatment, the dentist will take an X-ray of the root and may perform a pulp vitality test. Most pulp tests involve placing a cold stimulus on the tooth to check for a healthy response. Many teeth will be tested to compare the responses. If the test confirms the need for root canal therapy, it will be completed in either one or two appointments. The dentist will determine whether the root canal will be treated in one or two appointments based on the size and duration of an abscess and other factors. A tooth is likely to be treated in two appointments if it is getting a retreatment (being treated a second time). Patients are often curious how long a root canal takes to finish. They can generally expect one or two appointments of about 90 minutes each. 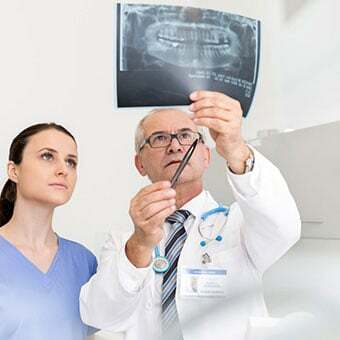 An endodontist, and some general dentists, will often perform root canal treatment using a microscope that attaches to the wall and hangs over the patient's mouth. This provides magnification that helps the treatment provider locate and treat all the necessary anatomy inside the tooth. Before starting the root canal, the dentist will numb the tooth with local anesthesia (such as lidocaine) to ensure patient comfort. When the tooth has become sufficiently numb, the dentist will place a rubber dam over the tooth. The rubber dam consists of a metal clamp that holds a latex sheet in place around the tooth so it can remain clean and isolated from saliva and contaminants. 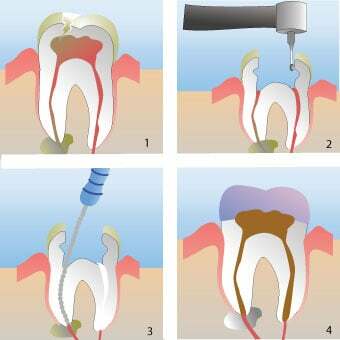 An opening is made through the top of the tooth and the pulp is removed from the chamber and canals. The canals are then cleaned with sodium hypochlorite or another disinfecting solution. The canals are then shaped with a series of files of increasing diameter to make sure all of the infected tooth structure is removed and there is room for an adequate root canal filling. A series of X-rays will be taken throughout the procedure to make sure the files are reaching the end of the root and all the canals are being adequately cleaned and shaped. 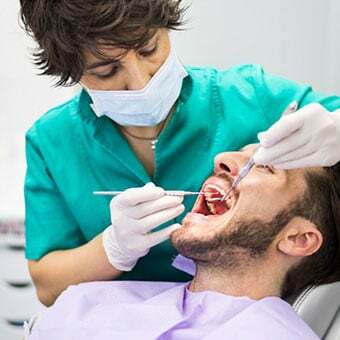 If the root canal is to be completed in two appointments, the dentist will place medicine like calcium hydroxide down the canal to help kill the bacteria at the end of the root and may prescribe an antibiotic to help combat the infection. A temporary filling will be placed to seal the opening in the tooth and a second appointment will be made for a week later or more. If the tooth is being treated in one appointment, the dentist will skip this part and go right to filling the root canal. When the root canal is to be filled, the dentist will again numb the tooth, place a rubber dam, and remove the temporary filling material. The canals are filled with a rubber-like material called gutta percha surrounded by a sealing paste. If an endodontist has performed the root canal, a temporary filling will be placed in the opening and a general dentist will place the permanent filling. After the root canal is completed, the tooth will likely need a crown to protect it from fracturing in the future. A post may be placed down one of the canals to provide an anchor for the filling and the tooth will be built up with a permanent filling. 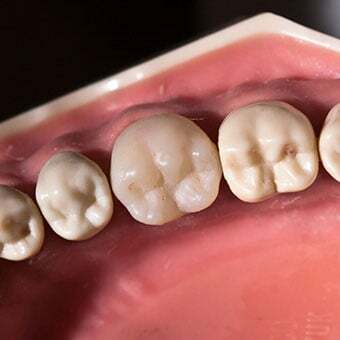 The dentist may choose to do the crown immediately, or may wait a brief period of time to make sure the tooth is free of pain before continuing with the crown. Usually, people will say that a root canal doesn't hurt any more than getting a simple filling, and they should be able to return to their normal activities immediately. Since a person needing a root canal is often already in extreme pain, the root canal treatment actually provides relief from pain and recovery time is very minimal. When the anesthesia wears off, the gums around the tooth will be sore from the rubber dam clamp, and it may feel a little sore when chewing with that tooth -- especially if the tooth was abscessed prior to treatment. Even though the nerve is no longer inside the tooth, there are still nerve endings around the outside of the tooth that may be inflamed and irritated as a result of an abscess or the root canal treatment itself. It is best to try chewing food on the opposite side of the mouth for a few days following the root canal to give the bone and tissues around the tooth time to calm down. Most pain or discomfort can be controlled by taking ibuprofen (Advil) or another over-the-counter pain medication when appropriate. Ibuprofen should not be used by people taking certain blood thinners or those with kidney disease or stomach ulcers. A person who is experiencing extreme pain following a root canal that isn't getting better after a few days should return to the treating dentist immediately for further evaluation. Since a root canal is often necessary because a person has a tooth that is either causing extreme pain or is infected, it is best to get root canal treatment immediately, even if the person is pregnant. Untreated pain will produce too much stress and an abscess could critically endanger the health of the mother and developing baby. If it is possible to plan the timing of the root canal treatment, the second trimester is generally the safest time for dental procedures. If possible, the patient should contact their OB-GYN as soon as they know they will need the root canal to keep the doctor informed and obtain any counsel necessary to protect the pregnancy. X-rays must be taken during the procedure, so it is imperative that a lead apron is used to protect the mother and baby. Tetracycline must be avoided as an antibiotic, as it can affect the baby's development. If these precautions are all followed, it is generally safe to get a root canal while pregnant. Since a tooth that has had a root canal has been hollowed out to a certain degree, it is more prone to fracture. Getting a crown placed on the tooth will almost completely prevent this, but it can still happen. Sometimes there may have been an undetected crack at the time the root canal was performed, and the tooth may need to be extracted even though the tooth was treated with a perfect root canal. In excessively curved roots, a file could break off inside the canal. Sometimes these files can be retrieved, but many times they cannot. If this happens, the tooth will be filled to the level of the file and monitored closely. If it was thoroughly cleaned before the file broke, the tooth may be unaffected. If not, it may need a surgical procedure to finish the root canal treatment. Sometimes, if the pulp canal is difficult to find due to narrowing or calcification, the tooth may become perforated while attempting to locate the canal. The tooth is perforated when the dental drill starts from the inside of the tooth and communicates a hole through to the outside of the tooth instead of remaining centered. Many perforations can be repaired, but if severe, may cause the tooth to have to be extracted. A root canal can become reinfected if the restoration has leaked, the patient doesn't have good oral hygiene, or because the sealing materials have degraded or broken down over time. Sometimes there may be more than the normal number of root canals in a tooth and the treating dentist may have missed the extra canal, leading to root canal failure. This canal may harbor infected tissue and will need to be cleaned out and filled. If a root canal has become reinfected, it can usually be retreated with another root canal. In this procedure, the endodontist will simply remove the gutta percha and sealing material through the opening in the tooth, clean out the canals and any additional canals, and seal them back up again. A retreatment is likely to be done in two visits. Sometimes a retreatment isn't possible and a tooth will require a surgical procedure to be saved. In this case, an endodontist may perform an apicoectomy, which involves accessing the root of the tooth through an incision made in the gums and bone. The tip of the root may be cut off and the area is cleaned and sealed from the end of the root. Upper molars have roots that are very close to the sinus cavities. Sometimes the roots actually penetrate into the sinus cavities. When these roots are treated with a root canal, there may be some sinus congestion resulting from inflammation or infection around that particular root. If some of the medicaments or sealing materials used during the root canal extrude out of the end of the root into the sinus cavity, sinus problems can occur afterward. Another condition that can occur after a root canal is discoloration of the tooth. Sometimes, this will even happen when the nerve in the tooth dies and can be the first sign indicating that a root canal is necessary. The tooth typically will become dark yellow, brown, or gray -- much more than surrounding teeth. If this color is an esthetic concern to the patient, especially if it is a front tooth, it can be treated with internally bleaching that specific tooth in a dental office or covering the tooth with a veneer or crown. There have been claims that leaving a tooth treated with a root canal inside the mouth causes a variety of health problems, including cancer. These claims are based on an assumption that root canal treatment can never fully get rid of the infected tissue and tooth structure and that keeping infected tissue inside the mouth induces a response by the body that leads to health problems. Such claims are not based on sound scientific evidence and rely on coincidence and correlation for substantiation. Often, such claims are used to promote expensive alternatives to traditional dental treatments that result in profit for those making the claims. There is more evidence to refute such claims than to support them. People who believe they may need a root canal should seek out a competent licensed dentist whom they can trust to diagnose disease and deliver evidence-based dental treatment, including root canal treatment when needed. Root canals are over 95% successful and can last a lifetime. The most important thing to do to make a root canal last as long as possible is get the permanent restoration (fillings or crowns) on the tooth immediately following the root canal and maintain that restoration with impeccable hygiene. A tooth that has had a root canal can still get a cavity, so a person must brush and floss the tooth thoroughly to keep it healthy. Since there is no nerve in the tooth, a person will not feel any symptoms if the tooth gets a cavity. 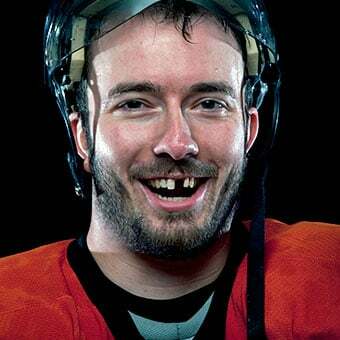 The tooth will only hurt if it gets fractured or gets another abscess around it. 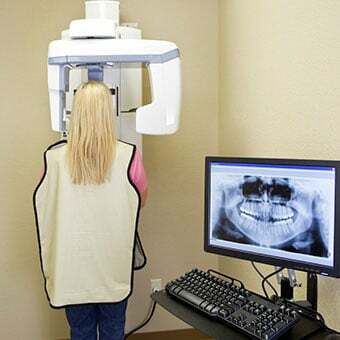 The dentist will want to take checkup X-rays from time to time to check the tooth for reinfection or other signs of failure. The cost of root canals varies depending on the tooth and whether it is being treated by a general dentist or an endodontist. Molars have more canals that need to be filled, so they are more expensive, and endodontists typically charge more due to their specialty training. The procedure cost of a single-rooted tooth (incisor or canine) may be anywhere from $400 to $1,000, and a multi-rooted tooth (premolar or molar) may be anywhere from $500 to $1,400. 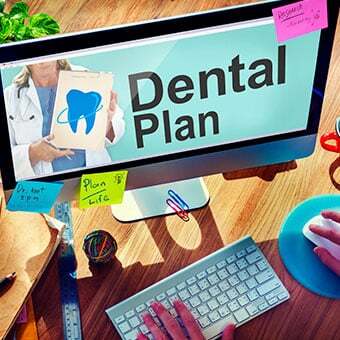 Most dental insurance plans cover root canal treatment. Saving the natural tooth is usually the best option, so root canal treatment is generally the treatment of choice. The only alternative to having a root canal is a tooth extraction and having it replaced with an implant, bridge, or denture. These procedures are more expensive than a root canal and often require more time and additional procedures to treat the surrounding teeth and tissues. If a tooth is extracted and not replaced with some type of restoration, chewing function will be impaired and teeth may shift. Root fracture: A tooth that has sustained a fracture down the root or through a significant portion of the crown of the tooth will continue to hurt or be infected even after a root canal is performed and is extracted instead. Lack of remaining tooth structure: If there isn't enough healthy tooth structure above the bone for a crown to attach to, root canal treatment is worthless. Sometimes, a crown lengthening procedure can be performed, which removes bone to expose more of the tooth. But careful examination must be performed by the restoring dentist to determine if such a procedure will have other disadvantages and should be avoided. Third molars: Third molars, or wisdom teeth, are often not in a functional position and should be extracted rather than being preserved with root canal treatment. Significant resorption: If a large amount of a tooth has dissolved away due to internal or external resorption, a root canal may not be able to save it. Many teeth in this situation must be extracted. Multiple root canals: The percentage chance for success decreases every time root canal treatment is performed on a tooth after the first time. If a patient has already had a root canal and they later need a re-treatment of the root canal on the same tooth, they must compare root canal treatment with other treatment options that would replace the tooth following extraction. In most instances, an implant supported crown will have a better chance for success than a tooth that needs a third or fourth root canal. Ultimately, the patient must decide to what extent they will go to save the tooth, and how comfortable they feel with their treatment options. The dentist and endodontist are very valuable in helping maintain perspective regarding the condition of a tooth and the likelihood for success with different treatment options. American Dental Association Division of Communications. "Getting to the root of endodontic (root canal) treatment The goal: preserving the tooth." Journal of the American Dental Association 132.3 (2001): 45-54. Watkins, C. A., et al. "Anticipated and experienced pain associated with endodontic therapy." Journal of the American Dental Association 133.1 (2002): 45-54.